In the 20th century, the French essayic mind may have tunneled to its deepest riches in the works of the late Roland Barthes. French esthetics, like any country's, can be indigestible (and untranslatable), but in Barthes a teasingly light touch leads readers into the most baffling blind alleys where gold dust shines on the bricks. In the present collection, Barthes and translator Howard are well met, with Barthes' own density reining in Howard's usual galloping abstractions. This is the second to appear of three posthumous sheafs of Barthes' half-scientific, half-charlatanesque word-arias on art, history, science, literature, and the study of signs. What is the rustle of language? "The rustle denotes a limit-noise; the noise of what, if it functioned perfectly, would make no noise. To rustle is to make audible the very evaporation of sound; the blurred, the tenuous, the fluctuating are perceived as signs of a sonic erasure. And language--can language rustle? As speech, it seems doomed to stuttering; as writing, to silence and to the distinction of signs; in any case, there is always too much meaning for language to afford a delight appropriate to its substance. Yet what is impossible is not inconceivable. The rustle of language forms a utopia. Which one? The utopia of meaning's music. . . It is the shudder of meaning that I want to interrogate here, as I listen to the rustle of language--of that language which is my nature as a modern man." That should clear things up, and readers wishing to see such theory put into practice may investigate Robert Coover's new novel, Gerald's Party, in which hardly a single sentence or paragraph arrives anywhere without experiencing the poetry of deflection from its object. 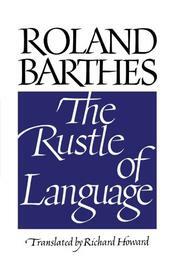 Perhaps the two outstanding essays herein are "The Death of the Author," about the breakdown of the authorial voice into several voices in a text, which are subsequently reconstituted into a Single voice by the reader; and "Leaving the Movie Theatre," about the hypnosis of cinema halls, the dancing beam of the projector, Barthes' distancing himself from the image, and his becoming unglued from the screen in "backing out" onto the street. Even these pleasures, as do the most ripely reachable of Barthes' thoughts, deliquesce into the kind of muggy clarity following a triple cognac. But one reads on, forever intrigued by Barthes' stripping off of stickum tape from one's mental appliances.